A Facebook page purporting to belong to an officer of a new county Democratic club has turned out to be fake and was deleted. We have seen MANY things in prior election cycles but nothing quite like this. 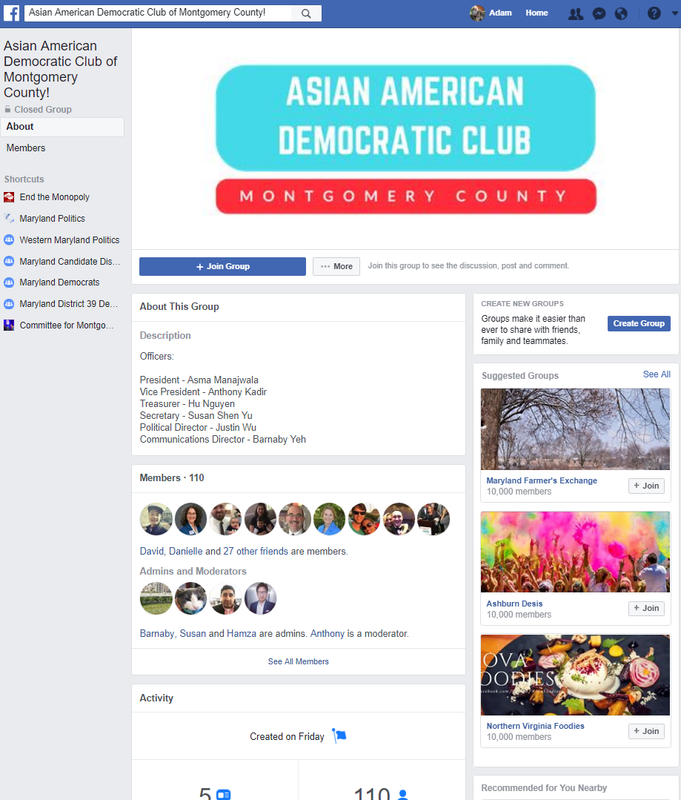 Recently, a new organization called the Asian American Democratic Club of Montgomery County was established. Their Facebook page went up on Friday, February 23. The club’s Treasurer was listed as Hu Nguyen. 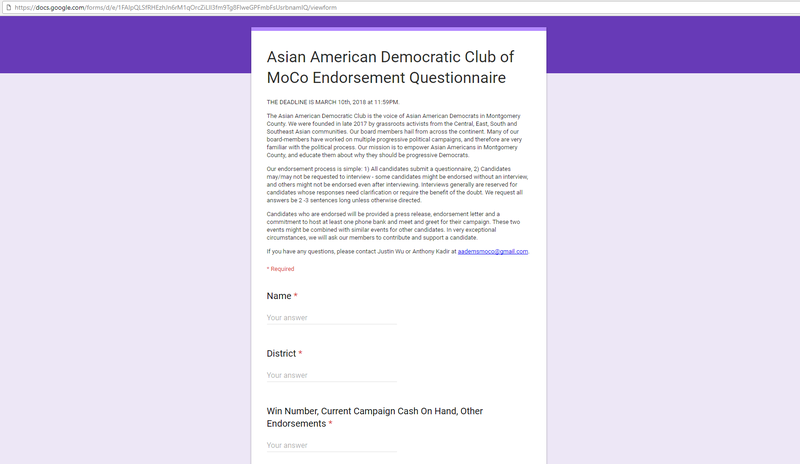 The club sent out a questionnaire to candidates. We reprint the first section below. Below was a Facebook page established in the name of Hu Nguyen. Curiously, this person’s gender was listed as male. Also of note is that the person’s birthday was listed as November 12, 1987. Hu Nguyen updated the club’s officer list to include her/himself and announced the club’s founding on Facebook. Hu Nguyen was also listed as an officer on the club’s Twitter page. 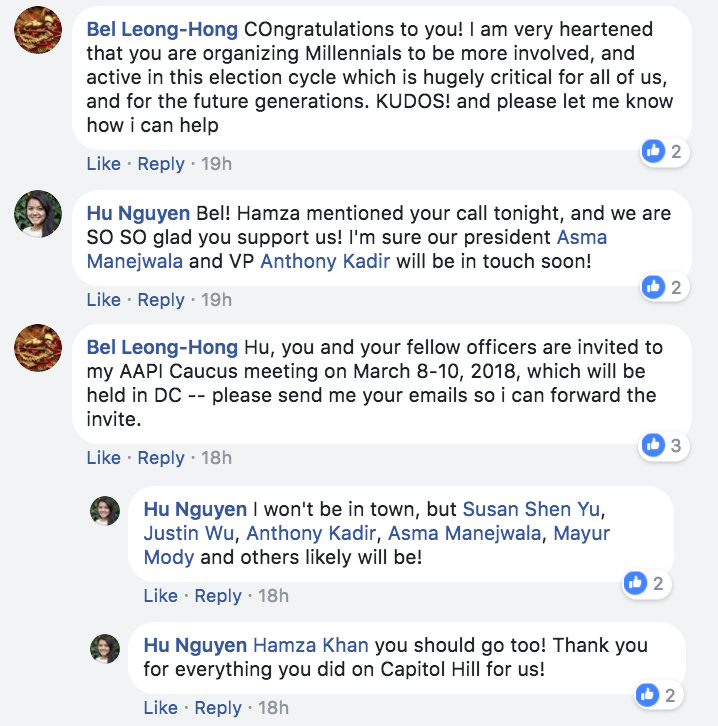 Hu Nguyen offered a positive review of Hamza Khan, who is a candidate for Delegate in District 15 and is an administrator of the club’s Facebook page, and also complimented him in a conversation on the club’s page. According to the Maryland State Board of Elections, Khan’s birthday is November 12, 1987 – the same as Hu Nguyen’s. 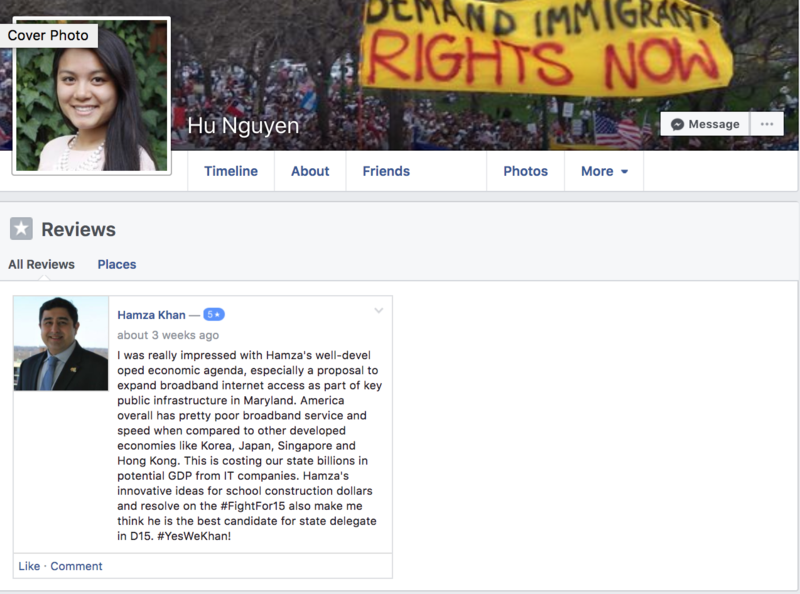 The profile picture on Hu Nguyen’s page matches the picture of a student at a prominent university in another part of the country. We reprint the original source of the picture below but we will not indicate her name or her university out of deference to her. Her real name is not Hu Nguyen. 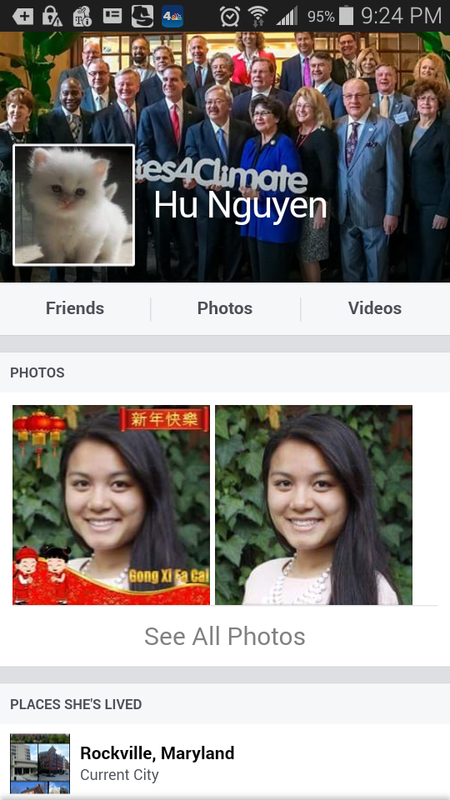 At least one individual filed a complaint to Facebook and the Hu Nguyen profile was removed. The statements above were also removed. Soon after, a new Hu Nguyen page was created. It used the same head shot as the first page and said the person was based in Rockville. However, the cover photo was taken from a publication in Memphis, Tennessee. That page has also now been deleted. Your author sent the following email to Hamza Khan on February 26 at 1:53 PM. Hamza, I am writing to ask about a person named Hu Nguyen. 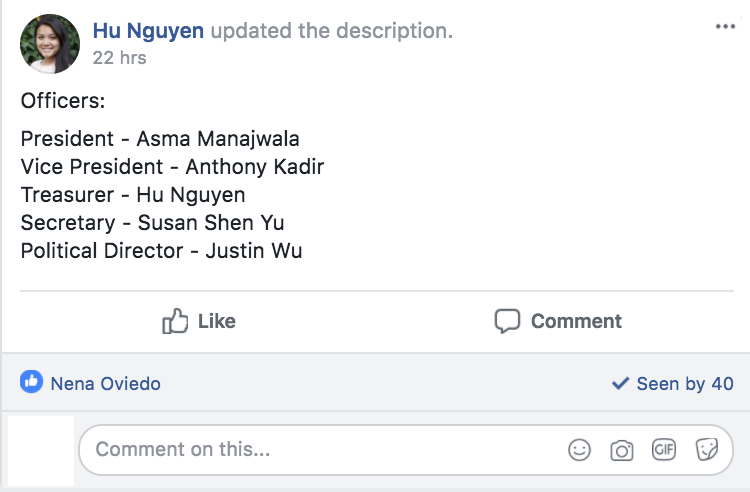 She is listed as an officer of the Asian American Democratic Club of Montgomery County on the club’s Facebook page and Twitter page. You are an administrator of the club’s Facebook page. She issued a positive review of you on Facebook and complimented you on the club’s page. According to Hu Nguyen’s Facebook page, the person’s gender was listed as male despite her very obvious appearance as female. Her birthday was November 12, 1987, which matches your birthday. The person’s Facebook profile picture matches that of a student at a university in another part of the country. 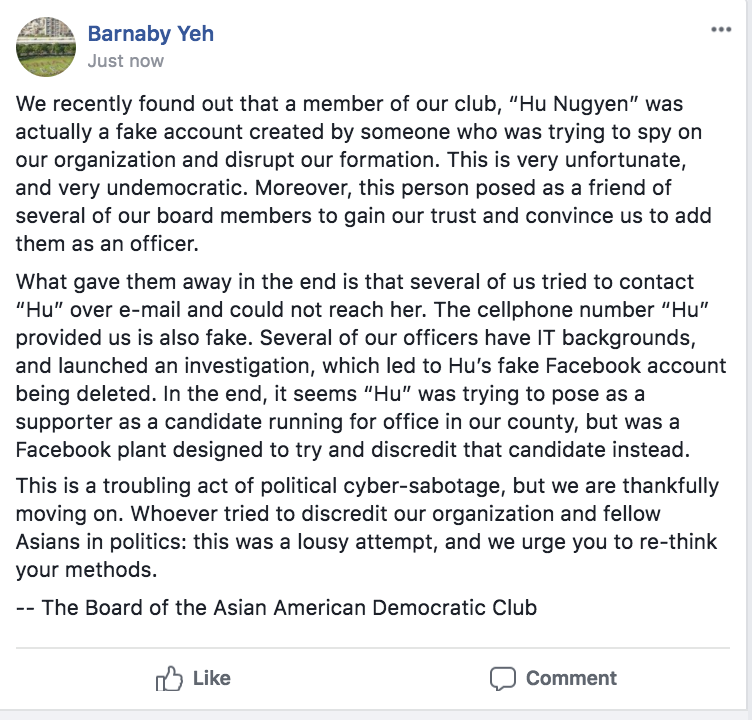 Hu Nguyen’s Facebook page has now been deleted. I am attaching screenshots, including one of the original source of Hu Nguyen’s profile picture. Can you comment on the record via email about Hu Nguyen? Can you describe the circumstances under which you met her and how she joined the club? Also, can you supply an email address so that I can contact her? Thank you – Adam Pagnucco. I actually am a mystified myself because despite her kind words about me, I’ve never met Hu Nguyen. She added me on Facebook claiming she met me at a fundraiser or meet and greet. Subsequently she disappeared on Facebook several times — in line with your statement above. I originally thought she was someone I met at a meet & greet for my campaign, but it turned out she’s not that person at all. As for why she has my birthday and she/he’s listed as a male on Facebook, from what I’ve been now told it was a deliberate attempt to try and tie her back to my campaign. This is unfortunate and very troubling. I think Barnaby Yeh, their communications director can direct you further. He is cc:ed here. 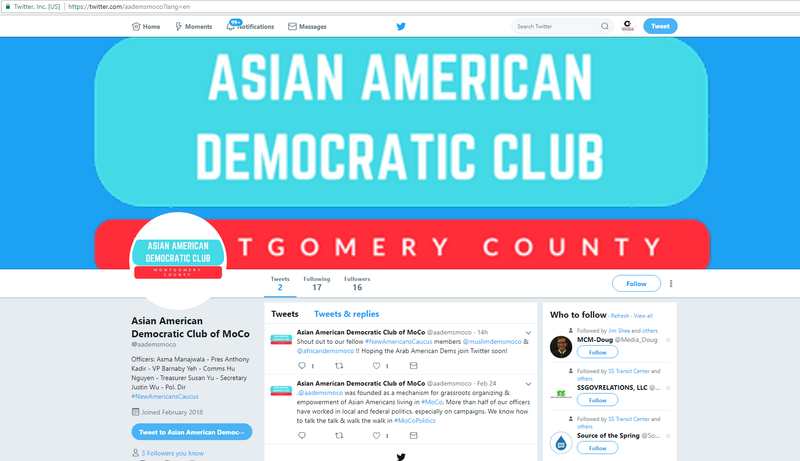 The Asian American Democratic Club of Montgomery County is a grassroots organization of local Asian American activists. Our founders include several local millennials who have worked on more than a few campaigns, been members of other Democratic groups, and are just passionate about getting people involved ahead of the June & November elections. We wanted to organize our club organically by spreading the word online, and decided to create a Facebook group for that purpose. 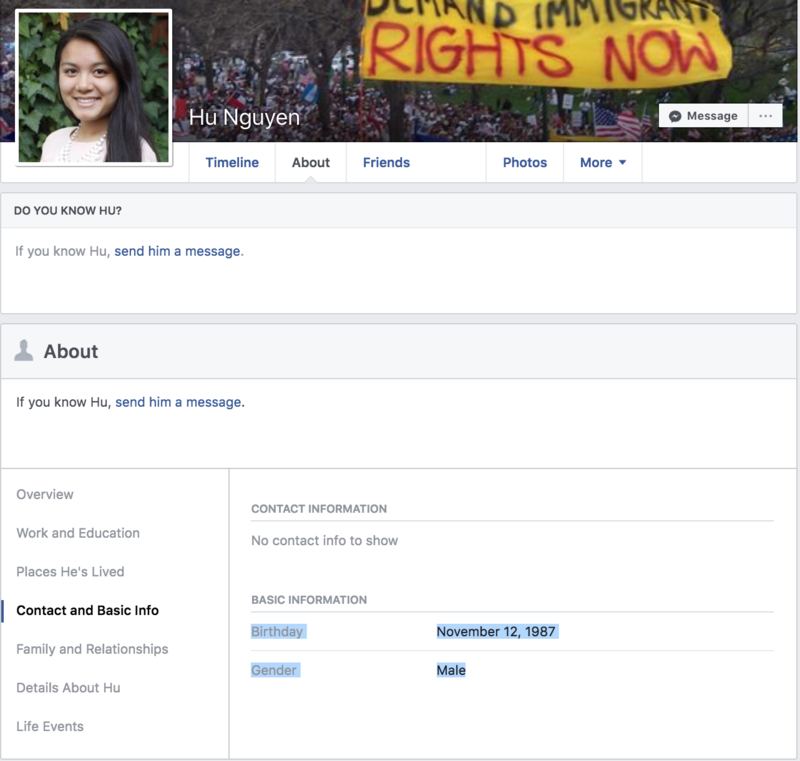 Hu had approached all of us online claiming to be an Asian American living in Montgomery County. Being that most of our board are millennials, we assumed that it was entirely plausible that we just never met her. She also posed as a friend of several officers’ mutual contacts, going as far as to claim to know the ex-girlfriend of one of our founding members, and claimed to have attended several local political events. She offered to be our treasurer, and given we a) have no money, and b) didn’t see the harm in having another board member, we agreed. However, we encountered some strange irregularities in trying to reach Hu starting this weekend. Hu began aggressively posting on social media on our behalf, which contravened our agreed-upon roles. We also received a notice from Twitter that someone had changed our Twitter account password, and they had traced the change to an IP address in Aspen Hill, MD. None of our officers had authorized such a change, and we began to investigate. We then also traced the IP e-mail address that Hu had provided to us, and discovered it was from the Ashburn area. At that point, we tried to contact Hu on Facebook to confirm, and further noticed Hu’s birthday and gender identity did not match who Hu presented themselves to be. We concluded Hu was misrepresenting themselves, and have reported the account as fraudulent. I hope this helps lays this all to rest. Let this be a lesson: before making someone an officer of your organization, make sure that they actually EXIST first!